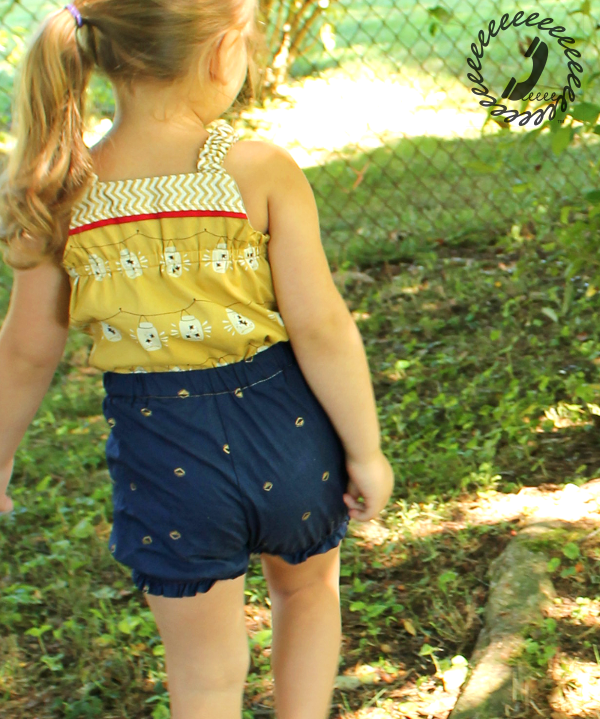 It’s been more than a year in the making, but today the the Paneled Sunsuit pattern is officially released and I couldn’t be more pleased with how it turned out. It’s been super slow here on the blog lately because my time for working is very limited and I had to switch gears from blogging to designing, so I thank you for your patience during this process and can’t wait to get back to some regular blogging this summer. 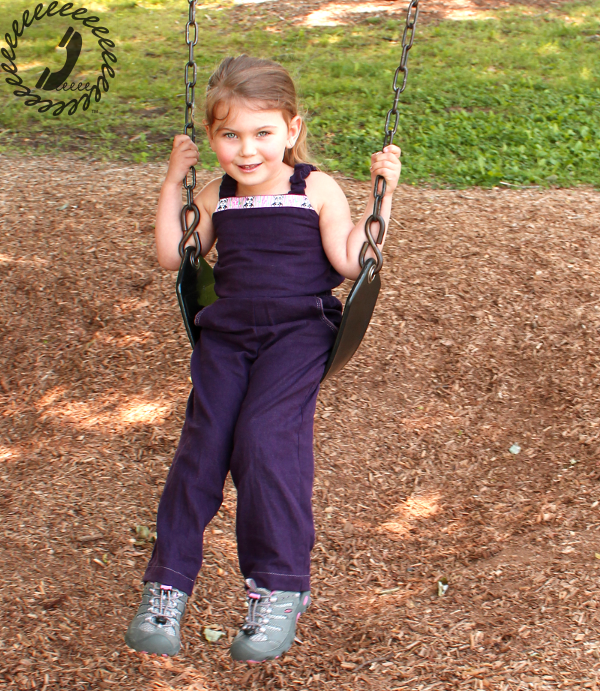 Though it’s called the Paneled Sunsuit, there are ten views included in the pattern. 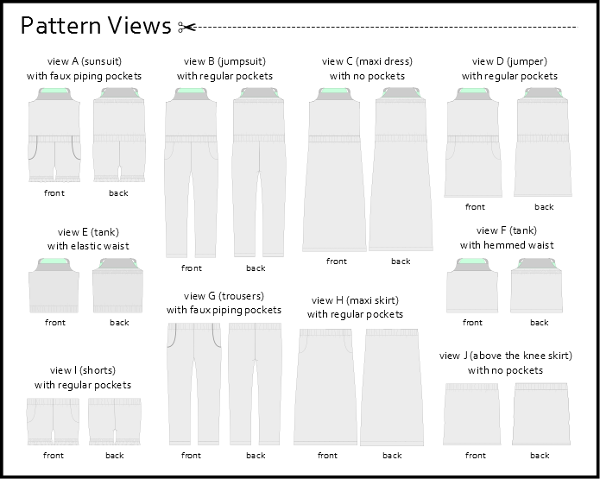 I’ll get into the details of each view next week, but for now you can see there’s a sunsuit, jumpsuit, maxi length dress, jumper, two different tanks, shorts, trousers, maxi length skirt, and a just above the knee length skirt. The size range is from newborn to 12 years. There is a diaper snap panel option for the littlest ones and yet there’s enough modesty coverage for the tween ages so that this pattern will really grow with your girl. One of my favorite things about the pattern is that the “panels” are a great place for scrap busting. I bet you thought I didn’t have any more of that jimmies fabric left right? Well I had just enough scraps to add to this super cute tank so the sprinkles live on, hehe. For this jumpsuit version, I used a bit of panda ribbon on the panel and I think it’s the perfect detail. I’d been saving that ribbon for ages and love seeing it in action finally. 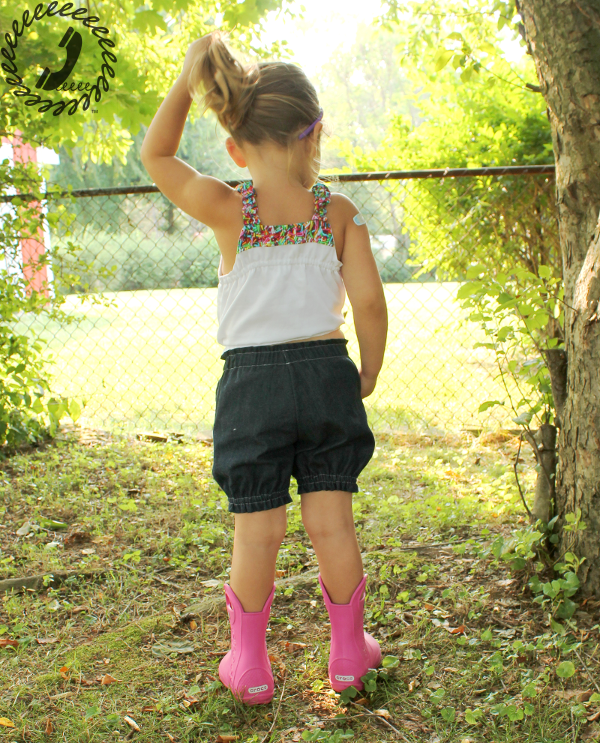 The Paneled Sunsuit pattern is available here (*affiliate link) exclusively through UpCraft Club through the weekend. **UPDATE it’s now available through the shop link** Have you heard of UpCraft Club yet? Elisa from Charming Doodle had a fabulous idea that has grown into what I consider the perfect club for all of us sewing enthusiasts who don’t necessarily fit into the category of “quilter.” The club membership is just $10 a month which allows you to download one pattern or class of your choice from the site each month as well as 20% off of everything else. I like that we get to choose what we pick so there’s no “wasted” month with a surprise pattern you already own, but the BEST part of membership for me is that it includes a membership card which allows you to join the JoAnn Fabrics VIP club. Since I’m not a part of a quilting guild I didn’t think I’d ever be eligible for their 10% discount VIP club, but UpCraft Club made it happen! And we all know 10% off fabric (even the sale price!) can go a long way in a month, hehe. Anyway, you don’t need to be a member of UpCraft Club to purchase the pattern there because it’s also a curated shop. So head on over, see how great the pattern listing looks (thank you Elisa! ), and consider purchasing the Paneled Sunsuit this holiday weekend. There was no requirement for me to mention UpCraft Club for the pattern lisiting, but I really LOVE the idea, am very excited about the future and where UpCraft Club is heading, and I’m proud to have my pattern play a part. I’m an affiliate of UpCraft Club which means I may get compensated if you purchase through these links.